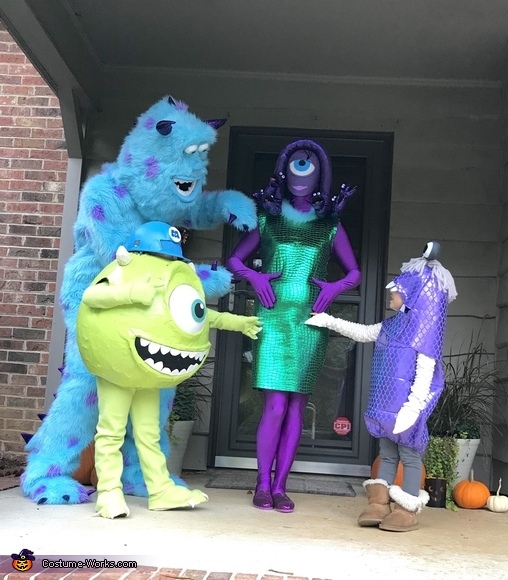 We are big Monsters Inc. fans, so one day when watching the movie my son mentioned he wanted to be Mike for Halloween. After looking for options to buy his costume I came away unimpressed with what was available. I thought to myself I could probably make one better than any of these and so I set off. We had never done homemade costumes before, but thought I would give it a go. One thing led to another and before I knew it I was making costumes for every member of the family. It took waaaay longer than I ever thought, but the end result was totally worth it and the reactions were great. We plan to wear the costumes for future Halloween events. As you can see from the one picture they also made for a great baby #3 announcement! The head was created using paper mache over a 36” diameter ballon purchased on Amazon. I cut out foam and glued it to the exterior and then paper mached over it to give it a 3D look and used a strofoam half circle purchased from a craft store for the eye. The hat is an actual hard hat that I painted blue and anchored onto the top of the head and to the inside foam padding for my son’s shoulders to rest on. The bodysuit, hands, and feet covers were sewn using a fleece fabric and I was able to find spray paint that matched perfectly. Unfortunately the picture of Mike occurred after trick or treating and my son fell and ripped the costume slightly. Nothing a little duct tape and spray paint cant fix. The mask is a repurposed Iron Man mask with a whole cute in the middle for the eye. The plastic meshing for the eye made it possible for my wife to see out of the eye. The snakes are made from a spandex fabric stuffed with polyfill with hangers added for shaping. The snake heads are easter eggs cut up and glued back together. We purchased a zentai bodysuit and made the dress out of fabric purchased from a craft store. My wife’s sparkly TOMS were a perfect addition to complete the costume. Sully was definetly the most time consuming. The bodysuit was purchased online but then modified slightly to make the foot covers actual feet with rubber bottoms. To make te head I used ½” foam and continued gluing layers in order to get the shape to my liking. I inserted a plastic adjustable headband from one of my son’s fireman helmets so that the head would fit snug on my head. I was able to find on eBay a used childrens Sully costume from the same company that made the bodysuit I purchased, so I bought that and used the faux fur to cover the head so that it matched the body. Various different types of foam were then cut and glued for the mouth, nose and eyes. A black fine mesh fabric was inserted in the mouth which allowed me to see out, without anyone seeing in. I had plans to make this costume as well, but due to time constraints ended up purchasing it which is ironic because it would probably have been the easiest to make.